How Likely Is Your Industry to Be Disrupted ? The topic of industry disruption — “a process whereby a smaller company with fewer resources is able to successfully challenge established incumbent businesses” — is rife with misconceptions (ie: it is a mysterious, random, and unpredictable event ; it happens to you in ways that are beyond your control ; who would have known ; etc.). While this can be true in industries slow to change or adopt technology, in many cases industry disruption is reasonably predictable. And with wisdom about predictability comes opportunity. To help business leaders better understand disruption, the chart below measures an industry’s current level of disruption as well as its susceptibility to future disruption. For the former, the presence and market penetration of disruptor companies as well as the incumbents’ financial performance were examined – including operational efficiency, commitment to innovation, and defenses against attack. 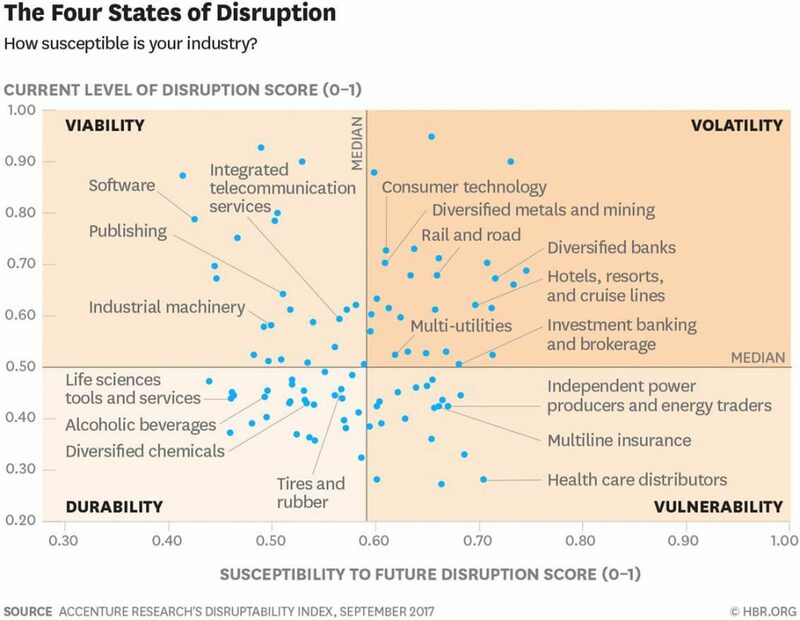 The following ” Disruptability Index ” positions 20 industry sectors — and 98 segments within those sectors — against those two axes. The median scores were then used as dividing points to highlight four distinct states of disruption: durability, vulnerability, volatility and viability. In the ” Durability State ” , there are efficient, mature industries — think alcoholic beverages or tires and rubber. Incumbents in these industries often own established brands, proprietary technology, and control of distribution channels. These advantages can be used to control against the sudden influx of non-traditional competition – if Executives are prepared to respond to changing consumer demands and take advantage of the growth opportunities those trends may reveal. For instance, in the United States and Europe, consumer tastes have shifted toward local craft beer. There were more than 5,000 craft breweries in the US in 2016, compared with 1,400 a decade ago. Multinational beer companies have responded by investing in or acquiring large craft brewers such as Lagunitas, Craft Brew Alliance, and Goose Island to gain an immediate foothold in the market. In the ” Vulnerability State ” , incumbents benefit from the continued presence of high barriers to entry such as regulation and capital requirements. But companies in this state often face increasing pressure to improve efficiency and reduce operating costs in their legacy businesses, and this pressure attracts opportunistic disruptors. Consider the health care sector: Newer companies are entering the market with the embedded ability to use connected sensors and artificial intelligence to monitor in real time the conditions of patients — especially those suffering from chronic conditions. Meanwhile, increasing numbers of incumbents are being compelled to adopt these technologies to stay competitive, even as cost and productivity pressures become acute. While not as prevalent yet, disruption is imminent in insurance, energy / resources, utilities, education, the military, government and other sectors historically insulated from change. And since the disruptors tend to be technology based companies, the market, products, mode of delivery, delivering a great User experience, convenience, context / usability, perception of value, etc. also changes. Because of this, and to avoid being marginalized over time, there needs to be an urgency for Executives in enterprises in this segment to develop skills associated with digital platforms and technology in general – to improve decision making and business outcomes. In the ” Volatility State ” , industries experience high levels of disruption and are susceptible to even more disruption in the short term. Previously strong barriers to entry have perished; fixed assets such as car fleets, hotels, bank branches, and landline infrastructure have become weaknesses. In transportation, for example, on-demand options have roiled the market, and traditional taxis are fighting back, belatedly, with apps such as Arro and Way2Ride. New competitors are not even staying away from more traditional, low-margin industries. Supermarkets are a case in point. Amazon’s acquisition of Whole Foods is forcing many incumbents in the grocery segment to rethink their go-to-market strategies. While not as urgent as in the ” Vulnerability State “, to move forward, organizations in a ” Volatile State ” need to be proactive in the near term to effect change in corporate direction, strategy, core competencies, culture, compensation, innovation, etc. In the ” Viability State ” new or reborn industries have emerged or endured a significant disruption – with rapid change part of the new environment to address new opportunities, business needs, rising User expectations, etc. In conjunction with this, the competitive landscape brings opportunities for new structural efficiencies, but high rates of innovation mean that sources of competitive advantage are often short-lived as new disruptors continually emerge. In this state, disruption is not (or is no longer) sudden and violent; it has become a constant. Consider the newspaper-publishing industry. Following a dramatic decline in print sales and advertising, some newspapers have reestablished themselves as digital platforms. Others are exploring subscription models. But the industry continues to face significant and persistent challenges related to ad revenues, as well as labor and production costs and shifting consumer demand. When faced with changing markets, technological impact, or industry disruption – many people cling to their legacy business. But leaders with look ahead who understand the various disruptive states and their company’s place therein will be more likely to see change as a positive force — not as a cue to protect the old – but as a compelling prompt to transform themselves and the enterprise to expand opportunities as well as to increase relevance and revenue. They will see disruption as a means to improve their organization and become more financially viable, and better positioned to innovate, grow current markets, venture into new market(s), move to a new business model, etc. In the ” Durability State ” companies must actively reinvent their legacy business rather than focus on preserving it. This means taking steps to both maintain cost leadership in their core business while also running extensive experiments to increase relevance — for example, by making key offerings not only cheaper but also better for their customers. The home retail segment, for example, underperforms the average investment in R&D for all industries by a factor of seven. There are exceptions, however, such as Lowe’s, the home-improvement retailer. In 2014, the company created Lowe’s Innovation Labs, an initiative that has produced the “Holoroom,” an evolving, mixed-reality design experience, and the “LoweBot” autonomous retail-service robot. This venture signals the home-improvement retailer’s commitment to building a customer experience that will appeal to the rising generation of so-called digital natives. Those in the ” Vulnerability State ” must address productivity challenges in their legacy businesses immediately and thoroughly – to get in shape for future innovations (their own or by competitors). One way is by reducing dependence on fixed assets. Another is by taking underused assets and monetizing them. Leading independent power producers, for example, have begun to deploy asset-light, platform-based business models. Consider Next Kraftwerke in Germany, which has developed a network of more than 3,000 distributed power-producing and consuming assets in Central Europe to create a “virtual power plant.” Next Kraftwerke offers services such as demand response, which reduces their customers’ electricity usage during peak periods to reduce costs. For companies in the ” Volatility State ” , decisively changing the current course is the only way to survive. Rather than simply abandoning the core business, companies will need to strike a delicate balance when making corporate and financial restructuring moves. The Danish conglomerate Maersk is one company that is acting wisely in the volatility state of disruption. It is separating its oil exploration and production, drilling rig, and oil tanker businesses into a new energy unit to be spun off, sold, or merged with other companies. It has already sold off Maersk Oil in a deal with Total for $7.5 billion. This pivot has enabled Maersk to lift its performance, focus on growing its core transport and logistics business in which it has global scale, and seek new opportunities for growth. Companies in the ” Viability State ” must embrace strategies that keep them in a constant state of innovation. This involves increasing the penetration of innovative offerings with existing customers while expanding aggressively into adjacent or entirely unchartered markets by leveraging the strength of their core business. To revisit the newspaper-publishing industry, consider the New York Times, which has close to 2.5 million digital-only subscribers and is continuously adding features and services. The company’s AI-powered chatbox enabled users to access up-to-the-minute polling data and analysis during the 2016 election. And its virtual-reality movies allowed subscribers to immerse themselves in journalists’ journeys. The Times has ambitious targets for international growth and is striving to double its digital revenue to $800 million by 2020. In the way of further insight, Marie Curie, who was awarded the Nobel Prize in Physics in 1903 and in Chemistry in 1911, had a point of view that would serve today’s business leaders well : “Nothing in life is to be feared – it is only to be understood”. Understanding where your organization and industry sits in terms of its susceptibility to disruption will help in making the needed momentous strategic choices. And the sooner the better. In summary, it is possible for business executives to assess how susceptible their organization and industry is to disruption. And why it’s critically important enterprise become more sophisticated at ” Business Innovation ” to achieve a successful ” Corporate Transformation “. Armed with this insight, it’s essential to have highly competent people – internal and external , with different and complementing capabilities – at the table, to define the right strategic response, execute on the plan, and adapt as needed to maximize opportunities and realize success – for the organization and those driving the process.